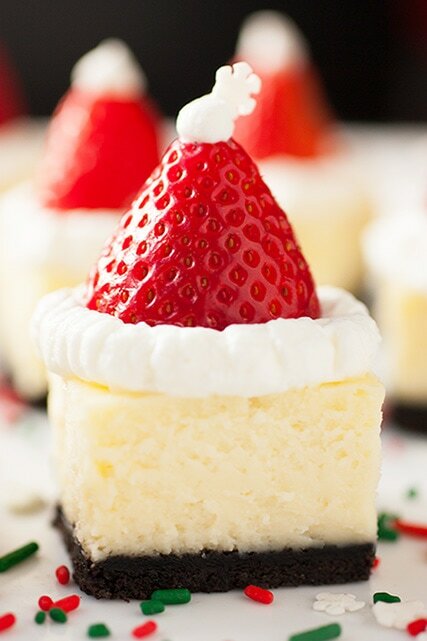 Santa Hat Cheesecake Bites – made with chocolatey Oreo cookie crust, a decadent white chocolate cheesecake filling and finished with a fresh strawberry and sweetened whipped cream. Festive and so delicious! I’m obsessed with cheesecake. Okay, I basically say that about every dessert. I’m obsessed with them all. So I guess we’ll say I am super obsessed with cheesecake. It’s like the best of the best. The luxurious of the luxurious. I adapted this recipe from my Heart Swirled White Chocolate Raspberry Cheesecake because it’s my favorite. I need to give my husband some credit in this post for pulling out some creative thinking. So often I ask his opinion when I’m going to create something to post, for example which variation of food would taste better or look the prettiest. 99% of the time he responds with “I like them all.” To which I respond with, “well you have a million opinions about everything else so why not this?” Yeah it’s funny but this time he finally responded with some great feedback. I explained I wanted to make these and asked if I should do a traditional graham cracker crust or an Oreo crust and he said “well the Oreo because it’s like a black Santa Belt.” Genius. I need his input more often =). No, I’m just glad he finally responded with an actual response this time around. I also wanted to mention, if you really really don’t want to make a cheesecake from scratch (but you should because it so much better) you could by the frozen cheesecake bites from the store then simply top them with the strawberries and sweetened whipped cream. A definite short cut when you are in a pinch. I hope you enjoy these divine little treats and remember to take a moment from all the hussle and bustle of the holidays…. to relax and enjoy the holidays….and eat cheesecake! I love fruit with cheesecake so this dessert was meant for me. Enjoy! How could I resist adding some sprinkles? 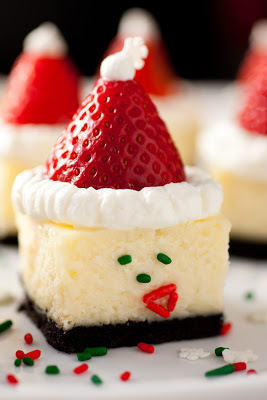 Want to see how easy this cheesecake recipe is? Watch the video! Made with chocolatey Oreo cookie crust, a decadent white chocolate cheesecake filling and finished with a fresh strawberry and sweetened whipped cream. 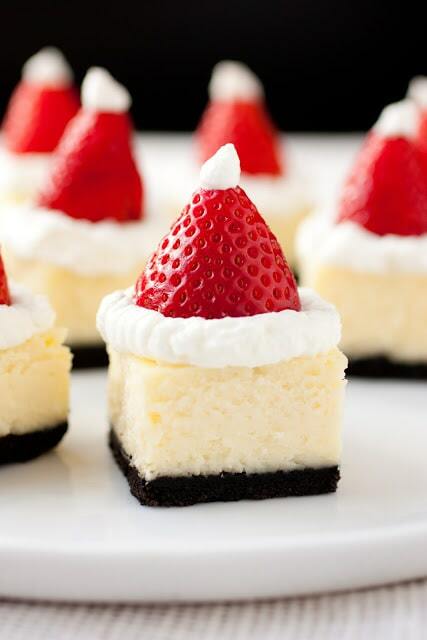 Festive and so delicious! Preheat oven to 325 degrees. Line an 8 by 8-inch baking dish with two large sheets of tinfoil (one going horizontally and one over the top of the other vertically. Make sure your sheets are long enough that you'll have an overhang of foil over the edges of the pan. Also, be sure to mold it well to the pan). Brush foil with 1/2 tbsp melted butter. In a mixing bowl, using a fork blend together crushed Oreos and 2 Tbsp melted butter until mixture is well combined and evenly moistened. In a large mixing bowl, using an electric hand mixer set on medium-low speed, blend together cream cheese and granulated sugar until mixture is smooth, about 30 seconds. Add in eggs and vanilla extract and mix until well blended. In a separate microwave safe bowl, heat white chocolate chips with 1/3 cup heavy cream on 50% power in 30 second intervals, stirring after each interval until melted and smooth. 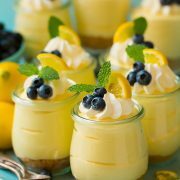 Pour melted white chocolate mixture into cream cheese mixture and blend on low speed until combined. Tap bowl against counter top about 30 times to release some of the air bubbles then pour mixture over prepared crust in baking dish. Bake in preheated oven for 40 minutes then turn oven off and without opening oven door allow cheesecake to rest in warm oven for 15 minutes. Remove from oven and let rest at room temperature for 30 minutes, then cover with plastic wrap and freeze for 3 hours or refrigerate for 6 hours. Once cheesecake is fully chilled and set, remove from freezer or refrigerator and lift cheesecake out of pan using the foil overhang. 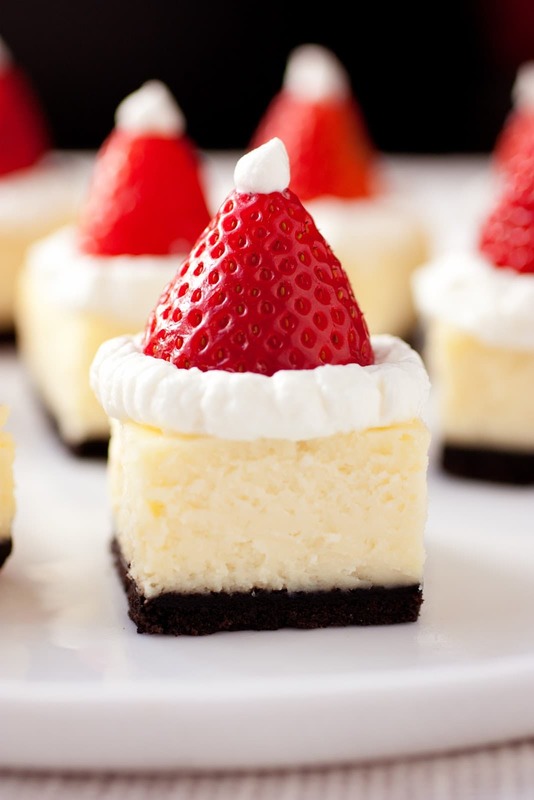 Cut cheesecake into squares (I'd recommend cutting them just a bit larger the the width of your strawberries. Also it's nice to keep some clean paper towels close by to clean your knife while cutting squares). In a mixing bowl, using an electric hand mixer set on high speed, whip remaining 1/2 cup heavy cream until soft peaks form, then add powdered sugar and mix until stiff peaks form. To assemble: cut a flat top off of each strawberry and lay flat side down over top of cheesecake. 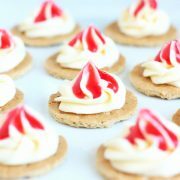 Fill a pastry bag (or Ziploc bag and cut a small tip of corner) with sweetened whipped cream and pipe around strawberry then finish with a small amount over the top of the "hat". 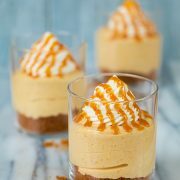 Serve immediately (for do ahead- you can make cheesecake the day before then assemble within an hour of serving the following day). Store in refrigerator in an airtight container. *Don't use Doublestuff Oreos. I processed the Oreos in a food processor but if you don't have one you can place them in a large Ziploc bag, seal bag and finely crush with a rolling pin . Sue: put them in a Tupperware container, without the hat pom pom, transported well. Added pompom last minute.